You can highlight all file types in the alternative file manager. 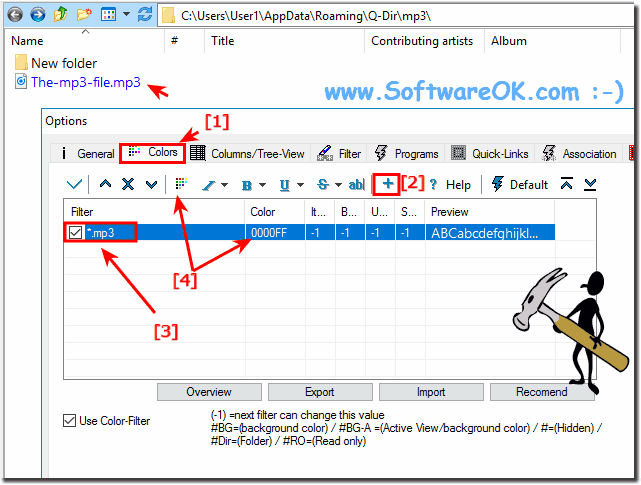 The solution here in the example is not just for the MP3 file extension! Color combinations for filtering multiple files are also possible! Simply via the main menu, Extras, then ... more options . File types *.xls or *.doc, *.jpg, etc. 1.) ... Color highlighting of MP3 files in Explorer view! 2.) ... Several different file types highlighted in color! 3.) ... If you do not want to use colors of syntax highlighting! See also: ► How to navigate up a folder? 1.) 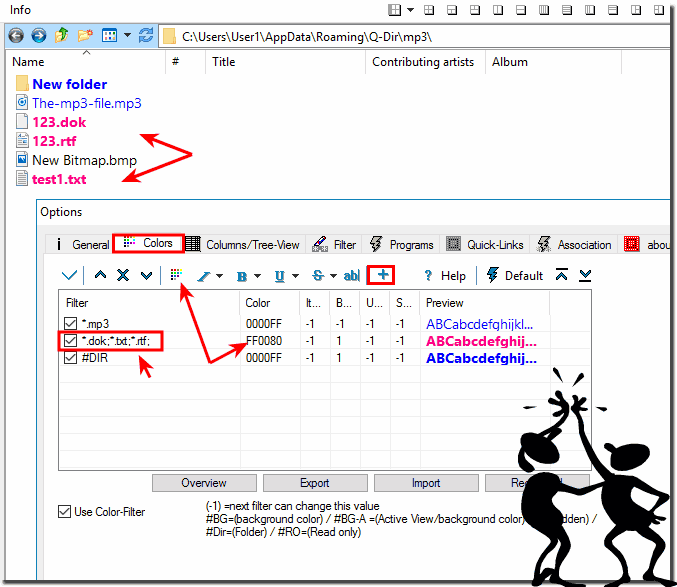 Color highlighting of MP3 files in Explorer view! Open the settings via the Main Menu ► Extras ► More Options. 2.) Several different file types highlighted in color! Multiple filtering or different colors for different file types are also possible. Here in the example different text documents are chained together and assigned to a common color filter. This is very handy as you save time. Here is the filter *.dok;*.txt;*.rtf; and in the color pink in this case! You can always add more text document file extensions that should be highlighted with the same color! Later, if necessary simply *.dok;* txt;*.rtf;*.odt; if you also want to highlight the Open Document text in the same color. Note: Use "#" for hidden files, or "#DIR" for the folder. (Image-2) Different file types in Different colors in Explorer-View! 3.) If you do not want to use colors of syntax highlighting! (Image-3) Disable Color filter for files and folders in Explorer views! This screenshot has been snipped under Windows 10. However, you can use this example Color filter for files and folders in Explorer views solution without hesitation for earlier Microsoft's Windows operating systems whether it's a Windows desktop, tablet, Surface Pro / Go, or even a server operating system. It has been tested on all and successfully verified. 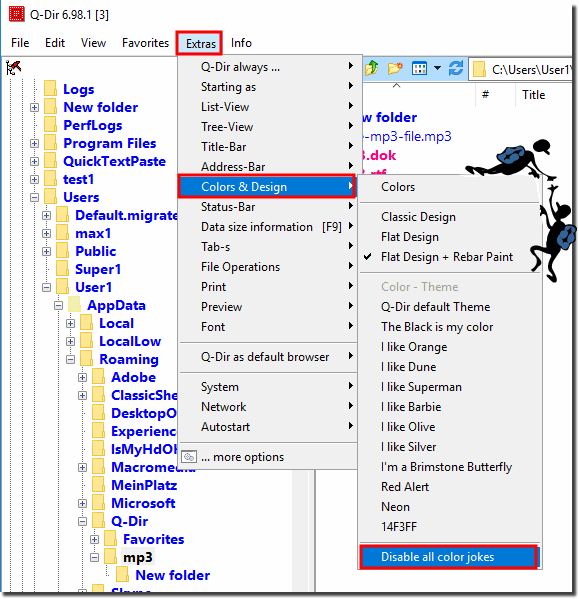 Q-DIR - FAQ-6: Color filter for files and folders in Explorer views eg MP3, but how?